The SABRE (Sodium-iodide with Active Background REjection) experiment is based on NaI(Tl) scintillating crystals and focuses on the achievement of a very low background via crystal purity and active rejection through liquid scintillator veto. The heart of the SABRE detector is high radio-purity thallium-doped sodium-Iodide (NaI(Tl)) scintillating crystals. Each collision between a Dark Matter particle and a nucleus releases a small amount of energy (<100 keV) that is converted into light. The amount of light is measured by two high quantum efficiency photomultiplier tubes (PMTs) directly coupled to each crystal. Each crystal is packaged along with two PMTs inside a high-purity light and air-tight copper enclosure. The NaI(Tl) detector module is operated inside a stainless steel vessel filled with liquid scintillator that acts as active shielding. The SABRE-PoP veto vessel hosted in Hall C of LNGS. Unlike gammas and neutrons background events, dark matter events are totally contained within the crystals. 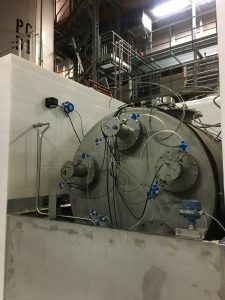 Therefore, the liquid scintillator can veto a large fraction of backgrounds coming from the intrinsic radioactive isotopes and residual contamination of the detector set-up materials. A passive shielding made of lead, polyethylene and water, installed outside the scintillator vessel, provides a further suppression of the background coming from the experimental hall. The development of SABRE is expected to follow a two phase program. The first phase (SABRE Proof-of-Principle or PoP) aims to develop and test radio-pure NaI(Tl) crystals in an active veto detector at LNGS. This phase will use a 5 kg crystal made following a specific protocol to reduce intrinsic background and external contaminations. The crystal will be operated inside 1.5 tons of liquid scintillator. When the PoP has proven that the radio-purity of the crystal matches the SABRE goal, the Collaboration will move to the second phase. The second phase foresees an array of low background crystal detectors to perform a dark matter search. The total mass of NaI(Tl) crystals is expected to be of the order of 50 kg. 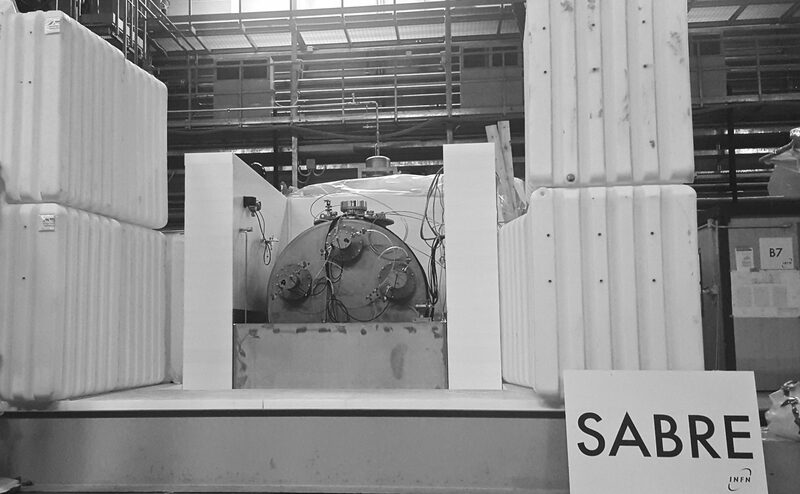 To strengthen the reliability of the result against possible seasonal systematic effects, we currently plan twin full-scale experiments, one in the northern hemisphere at LNGS, in Italy, and one in the southern hemisphere inside the Stawell gold mine in Victoria, Australia, which is being converted into an underground laboratory (SUPL).